In 1983, NASA bought “Bubbleman” from the University of Pennsylvania. “Bubbleman” was a software program that NASA wanted to use in order to test the responses of the human body to certain procedures and workstation arrangements on the Space Shuttle. “Bubbleman” was designed by Dr. Norman Badler, a CIS professor who has been designing software applications for human factors research for more than twenty years. 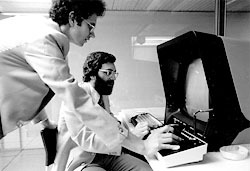 Using what he had learned in the design of “Bubbleman”, Badler eventually created Jack™ a more advanced program written in a mix of C and C++ that was capable of responding more specifically and precisely to various stimuli. For example, Badler used Jack in 1991 to see how the human body responded to different car cockpit setups. By 1989, Badler’s research laboratory was a popular government contractor. The laboratory had a DEC VAX server linked by an Ethernet connection to workstations with SGI and HP display equipment, and an Apple LaserWriter printer.